As we celebrate the golden anniversary of humanity’s first trip to the Moon, command module pilot Jim Lovell recounts the epic voyage. Jim Lovell sat down to chat with Astronomy magazine in June 2018. “It was the best of times, it was the worst of times.” With these dozen words, Charles Dickens launched A Tale of Two Cities. Anyone who looks back to 1968, however, would have to be wearing rose-tinted glasses to see much good. A divisive war, tragic assassinations, and appalling riots rocked the United States. Even 50 years later, it’s hard to find much worth celebrating. Until the final two weeks of the year rolled around, that is. On the morning of December 21, astronauts Frank Borman, James Lovell, and Bill Anders soared off the launchpad at Florida’s Kennedy Space Center and later that day became the first humans to slip the bonds of Earth’s gravity. Apollo 8 would go to the Moon, orbit our satellite on Christmas Eve, and return safely to Earth on December 27. This was Lovell’s third trip into space. He had teamed with Borman on Gemini VII in December 1965, when they performed the first rendezvous with another manned spacecraft, and with Buzz Aldrin on Gemini XII in November 1966 in that program’s final mission. Anders was a rookie who would not fly again. Recently, I had the honor to interview Captain Lovell about the Apollo 8 mission at the Lake Forest Library in Illinois. At 90, he remains as sharp and engaging as he was during the glory days of spaceflight a half-century ago. Earth rises over the lunar limb as Apollo 8 comes out from behind the Moon. The lunar horizon lay about 485 miles (780 km) from the spacecraft when Bill Anders captured the iconic scene. Astronomy: Thank you, Captain Lovell, we really appreciate you being here today and talking with us about Apollo 8, whose 50th anniversary is coming up in just a few months. NASA’s original plans were to test the lunar module in Earth orbit on your Apollo mission, but delays in the lunar module program changed those plans. How lucky did you feel that the mission order changed and you were able to go to the Moon instead of testing the lunar module? Lovell: I guess there’s a certain amount of luck in everybody’s life, and we were originally going to be Earth orbital. And of course I had been Earth orbital for 14 days in Gemini VII and then Gemini XII. . . . But the change, due to some intelligence we got about the Russians and also due to the fact that Grumman could not get the lunar module ready, actually changed things completely. I felt elated, to tell you the truth, because [otherwise] I was going to be going around the Earth several times, and so this was entirely new to me. And all admiration to NASA hierarchy that they were able to look at the spacecraft and take the chances and to make a very successful flight. Astronomy: Apollo 8 was the first of nine missions that went to the Moon, and there were a lot of things that no one had ever done in history. I’m curious what it felt like to be the first people to fly on the Saturn V and feel the power of that rocket underneath you. Lovell: We were the first people, and it was the third Saturn V built. The first two were test vehicles, and both of them had problems. So one of the things that NASA had to think about when they were discussing changing the mission was, “Well, is that Saturn V going to be ready? Is it going to have glitches in it?” And they went to the manufacturers and they talked to them and they said, “Yes, we’re going to be OK, we found out what’s wrong. No problem at all.” . . . In my personal case, I didn’t think too much about it. I took their word for it. We’re going. I didn’t have second thoughts about this flight whatsoever. As a matter of fact, I was a little bit different than, especially, Frank. Frank looked at it as beating the Russians; I looked at it as a mini Lewis and Clark expedition. We’re going to new territories, we’re going to do new things. You know being first before the Russians was good, but it wasn’t the main reason that I thought it would be pertinent. Astronomy: Certainly 50 years now in the future the Lewis and Clark aspect is much bigger than the beating the Russians aspect. The crew of Apollo 8 — (left to right) James Lovell, Bill Anders, and Frank Borman — pose on a simulator at Kennedy Space Center just a month before they took off for the Moon. Astronomy: With all the new experiences, did it help your comfort level to be with Frank Borman on the mission since you had already flown with him on Gemini VII? Lovell: Yeah, Frank and I knew each other. We spent two weeks in Gemini VII to see how man could live for two weeks in zero gravity. We got to know each other quite well, as you can imagine. And there’s a whole story going by that when we were on the deck of the aircraft carrier, we announced our engagement. Astronomy: That’s good. Did it feel any different when you left Earth’s gravity, being the first people ever to leave Earth’s gravity behind and go toward the Moon? What was that feeling like? And then looking back, right after that, when the engine stopped and we were up to a little bit over 23,000 miles an hour, you could look back and see the Earth shrinking. . . . It was sort of like if you’re in an automobile and you’re going through a tunnel, [when] you look in the rearview mirror and you can see the tunnel opening slowly closing and closing. That’s exactly what that felt like. Astronomy: Was it a little scary? Seagulls scatter as Apollo 8 lifts into the skies above Florida’s east coast December 21, 1968. Astronomy: You were the navigator on Apollo 8. Was it easy or difficult to actually sight the stars through the spacecraft window? Astronomy: I gather Frank got sick on the way to the Moon. Did that create any concerns on your part that it might be more than a 24-hour bug kind of thing? Lovell: No. I knew what it was — he had motion sickness. Although he was a strong Air Force captain . . . I was with him for two weeks [on Gemini VII and he got a little queasy]. My biggest regret was not to have called Mission Control and said, “Look it, I know that Frank has only motion sickness. He’s going to join us in a little while. We are not turning back. Let there be no thought about stopping this mission now. Apollo 8 is going to go to the Moon, we’re going to do those things assigned to us, and we’re going to go with your help.” But I didn’t do that. I just let it float back and forth. And the doctors were thinking about the return trip. Quite frankly, both my flights, 8 and 13, we had never really practiced the return flight. . . . I think I tried it once or twice on the computer. . . . I much rather would have gone right around the Moon and come home. Astronomy: That brings up another question. You mentioned your training in terms of coming back from the Moon, but did your Apollo 8 training really prepare you for the kinds of things that you did on the trip and for all the things you would see? Did you feel comfortably trained ahead of time, or was it surprising in any way? Lovell: In the short time we had to retrain from an Earth-orbital flight, which was the original Apollo 8 [plan], everything worked. We weren’t surprised. We weren’t surprised when we got to the Moon, either. Of course, we had pictures of the farside before we got there. And so everything worked fine. And it’s amazing. I think the spacecraft, Apollo 8, was one of the few incident-free craft that ever went to the Moon, with the least amount of problems. Humanity’s first view of the whole Earth came as Apollo 8 receded from our planet. This view shows south up, with South America at top center. Astronomy: Let’s talk a little bit about your reading from the book of Genesis on Christmas Eve. How did it come about, and was it a joint decision among the three of you or was it one in particular? Lovell: This all started when we started training [and] found out we were going to be orbiting the Moon on Christmas Eve. You know, what a coincidence. 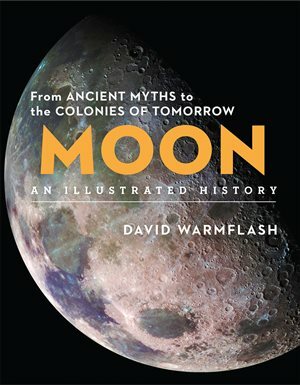 First flight to the Moon on a year that, looking back on it now, was a very poor year in the United States — the war was going on, the riots, and the assassinations. So one night he [started to think about what we could say], and nothing came out. Until his wife walked down the stairs and asked him, “Well, what are you doing? You’re up late.” And he told her the story. And she said, “Well, that’s simple — just have them read the first 10 verses of Genesis from the Old Testament. That tells everything.” And so that’s how it came to pass. Astronomy: You and your crew were the first people ever to see Earth rising as you were coming back from around the farside of the Moon. Could you describe how you took the photo or how the photo was taken? Lovell: For a long time it was, “Who took that picture?” But actually, the true story is that Bill Anders took the picture. We were coming around, actually it was the third orbit. Bill and Frank were looking out the right window, and we saw the Earth come up. And then the spacecraft [moved] as we were going around the Moon. And I was on the left window, and then I saw the perfect composition that you now see in the famous photograph. So I said, “Bill, Bill, look here, take this picture.” And I gave him the color film and he said, “Now just a minute Lovell, just a minute.” And then I actually claim that I told him how to compose the picture so it would come out good. But he took the picture. And very fortunately we did that. I think that was the one iconic thing that we brought back from that flight that could tell everybody, in just a photograph, exactly their position in life. Astronomy: Did you have a feeling that it would become as iconic as it did when you were seeing it yourself, or not until you got back? Lovell: We thought it was very important. . . . We thought that it would have meaning to those back on Earth. And [we were] very fortunate. When the word came down to do the flight, the three of us were in Downey, California, going over the spacecraft. And they called Frank back [to explain the mission changes]. [He saw] his job was to beat the Russians, get around [the Moon], and they said, “No, no, this is not that at all. You gotta take pictures. We want the TV camera. . . . We all want that.” And so it slowly evolved that [Frank] got to be more and more really knowing the meaning of this particular flight. A camera aboard a U.S. Air Force plane captured the fiery re-entry of Apollo 8, as the first manned mission to the Moon plummeted through Earth’s atmosphere December 27, 1968. Astronomy: When you’re on the farside of the Moon and getting ready to come back, did you have any concerns about whether the rocket would fire? Neil and Buzz said that when they were on the surface, they chose not to think about what would happen if the lunar module rocket wouldn’t fire. Lovell: I don’t think that any flight to the Moon and back, ever, [wondered] whether the engines would light again or not. I mean, you have to take that on faith. There is no alternative, that’s what’s going to happen. And it’s kind of funny. I was running the computer, and so we had a countdown on the computer with the exact time to light the engine. And I had my finger on a thing called “proceed,” and I must have hesitated just a minute. Frank said, “Push the button, push the button.” So I pushed the button, and the engine came on, very, very gently at first, and then it slowly pushed us back in our seats so we knew the engine was running. And I could see on the computer the increase in velocity as we were going along, and I knew that we had to attain a certain velocity to escape from the Moon to come back to the Earth. Astronomy: You had mentioned before about how in America and around the world, 1968 was a time of great upheaval. Apollo 8 came at the end of that long year and put a much different, and more positive, spin on that year. Did you have any sense at the time about how your mission was going to change many people’s minds about what the year had been like? Lovell: No, we didn’t. As long as we were in the spacecraft coming back we only talked to one person, and that was the CapCom [the capsule communicator]. We did start to read newspapers on the ship that had picked us up to give us a feeling of really what all happened. When we got to Hawaii, we were getting things from our wives, our friends, and just the people there. But the sense of Apollo 8 took a little while to sink into me. We knew it was a winner, it was a success, but then the flow of telegrams started coming [in]. And the one which was iconic — you’ve probably heard [of it] — all it said was, “You’ve made 1968.” It gave us in three words just what had happened. So throughout the years, up to now, this is really the high point of my space career. Even though 13 was more of a challenge, 8 was the very first one, the first expedition going to new lands. That was the one I like the most. The Apollo 8 command module floats in the Pacific Ocean as swimmers from the USS Yorktown ready it to be hoisted onto the ship. Astronomy: Last year the International Astronomical Union made it official and finally named one of the lunar features you used for navigation as Mount Marilyn, after your wife. Could you tell us about the mountain’s importance during that first lunar flight? Lovell: Well, yes, let me lead up to that. While we were training to go to the Moon on Apollo 8, we had photographs of the Moon. . . . As we looked at the nearside — and our job was to look for suitable landing spots through photography and eyesight — the general consensus of the people, the geologists, and everybody [else was they] wanted the first flight to land in the Sea of Tranquillity. That looked like a pretty good area; it was on the nearside of the Moon. And as I looked around and we planned our trajectories on the photograph, we came over this little triangular mountain, and it was unusual in the fact that it sort of stood out. It was on the shoreline of the Sea of Tranquillity. And so, during one of the days, I said, “I’m naming that Mount Marilyn, after Marilyn Lovell.” No one said anything. In fact, we put it in the flight plan and all that. And on Apollo 8 we went over Mount Marilyn, and looked at the fact that it led the way into the Sea of Tranquillity. And then Mount Marilyn stayed on the paperwork that was followed up on 10 and 11, and . . . they started looking and said that this was a good spot. And the astrophysicists, the people that were looking at the trajectory, said yeah, because that looks like if you start at 60 miles and do the initiation there, somewhere in that vicinity, you’re separated from the command module and you fire the lunar module engine, it will take you down into the areas that we want you to land, which is basically flat areas. And so it turned up on the paperwork of Apollo 10, and they did their descent-abort mission. In fact, there’s a picture taken from the lunar module looking back at the command module just after they passed Mount Marilyn, and behind the command module is Mount Marilyn. [See the photo on p. 33.] And then of course on 11 they came by and, sure enough, that’s what they had used — it was a steppingstone, initial point, of Apollo 11. Well, it was there for years, informally, but it got a life of its own. . . . It was in books; it was in my book, of course; and it was in the early part of the movie Apollo 13 when the two characters, Tom Hanks and [Kathleen Quinlan], were looking up and she says, “Where’s my mountain?” “It’s up there.” And so around 2014, a good friend of mine, an astrophysicist by the name of Mark Robinson out in Arizona, said, “Let’s see if we can get the International Astronomical Union [IAU] to give it an official name.” So we applied the proper way. “No, no, no. I mean, come on, we’re naming these [craters] after astronomers, physicists, people like that.” So we got a very polite denial. And meanwhile I had looked up all the mountains on the nearside, how they were named, and they were mostly very famous people. There was one mountain named after a woman, and it was pulled from mythology: Mount Agnes. And so I thought about it for a while. Then Robinson said, “Let’s try it again. Let’s really push it, because it has certain meanings to Apollo 11.” . . . And so we did. And funny, there was agreement because other people in the IAU also started to turn their heads, and so it turned out that they finally named it and said, “Really, you know, there ought to be a little romanticism in the spaceflights. I mean, not everything strictly cut and dried . . . but here is something that relates itself to the first lunar landing. It’s well prominent there, it’s really not named as part of the mountain range Secchi. . . . But then they all agreed that they should name it Mount Marilyn. So from that day on, in perpetuity, looking down at me long after I’m gone, will be this little triangular mountain named Mount Marilyn. Navy personnel greet the Apollo 8 astronauts as they step on the deck of the Yorktown after their historic mission. Astronomy: That seems appropriate. Seven months after Apollo 8 you were on the beach with Charles Lindbergh watching Apollo 11 lift off. Could you tell us what it was like to spend that time with a fellow space pioneer or aviation pioneer? He looked at it, and he kind of thought for a while, and he said, “You know something? Yeah, it’s going to be quite significant. But Apollo 8, that’s the flight that I will remember.” Because I think in his mind, he was thinking about the 34 hours from New York to Paris, that long journey the first time to go there. And he said Apollo 8 was the first one to make that 240,000-mile voyage to the Moon. Their landing there is only the last 60 miles. And so I thought that was pretty nice of him. Astronomy: I know you’ve done thousands of interviews. Is there any question that you haven’t been asked that you’ve always wanted to answer? Lovell: No, I think that I have a different perspective on a lot of things from Apollo 8. It’s not a question, it’s something in my own mind, because you know normally, our world is only as far as the eye can see. Out in the country, maybe mountains or hills or trees really express how far we [can see] because we’re a small body on a huge planet. And in cities, our world is defined by buildings. When you walk down the streets of Chicago, your world is really only as far as your eyes reflect off of the buildings. And in buildings, for instance, the building we’re in right now, our world is solely within these walls. But on Apollo 8, when I looked out at the Earth for the first time, 240,000 miles away, my world suddenly expanded to infinity. I could put my thumb up — and I say this many times and in thousands of talks — I could put my thumb up to the window and completely hide the Earth. And I suddenly realized that behind my thumb, on this little planet, was about 5 billion people. Everything I ever knew was behind my thumb, and I suddenly got a different perspective of my position in life. Because when I look back at the Earth and I realize it was only a small planet, one of nine inside the solar system, it was a mere speck in the Milky Way Galaxy, and it was lost to oblivion in the universe. And so it gave me a feeling of, “How do I get here,” that God must have really given mankind a stage upon which to perform, and how that play turns out is up to us.